Board meetings are organized by companies or organizations to discuss developments or issues related to the company. The board consists of minimum six-seven members. The Chief executive officer is appointed by the board of directors who is responsible to set out the overall strategic direction. The board meetings are published in newspapers to inform concerned people about the meeting. In these types of ads usually, the agenda, venue and the timing of the meeting are mentioned. You can see the ad samples on our website while booking the ad. Companies usually book these types of ads in newspapers in Display formats where a detailed text is given along with the company logo. 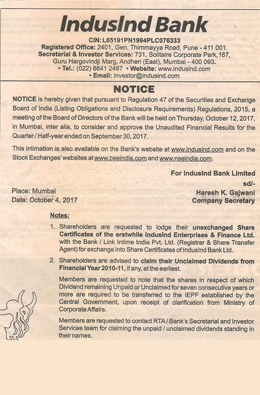 Newspaper ad booking under the category ‘Board meetings’ has been made much easier . In just few mouse clicks you can book the ad in your preferred newspaper. To book newspaper ad under this category you have to follow few steps. Call on 09051444946 or 07003779265 or leave an enquiry by sending us your name and contact information. Provide us the ad matter and ad release date along with relevant documents. Your ad will be published in your preferred newspaper once you clear the payment. You can book Board Meeting Notice ads instantly through the online ad booking portal of releaseMyAd. We also offer discounted packages for booking ads in leading newspapers of India. After making the payment, you will receive an auto generated invoice confirming your company notice Ad booking in your preferred newspaper. Instant booking of ‘Board meetings’ ads at lowest rates. For additional information about the rates, you can visit our ad booking portal. No extra costs while you book your company notice ad online. Keep track of your ad status till the time it is finally printed. Multiple payment options that include credit cards, debit cards, net banking etc. All these payments are SSL encrypted and therefore completely secure. You can also pay offline via cheque or cash.